Han Solo wraps up warm on Hoth! One of the things you'll notice when flicking through the recent (and highly recommended) Star Wars: The Ultimate Action Figure Collection* coffee table guide is just how many pages are dedicated to everybody's favourite Star Wars rebel Han Solo. 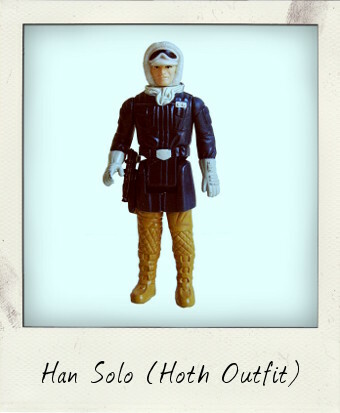 A whopping nine pages feature the man himself in all his various costume changes, including this vintage 3¾ inch Kenner version in his Hoth Outfit as modelled in the stunning opening sequence from Irvin Kershner's The Empire Strikes Back. Han Solo's dramatic rescue of Luke Skywalker in the icy Hoth wasteland is one of the most memorable scenes in the entire trilogy, and the Hoth Battle Gear is an excellent match for the costume as seen in the movie. Sadly, this is probably the Kenner figure which least resembles Harrison Ford in any of their attempts to capture his likeness. 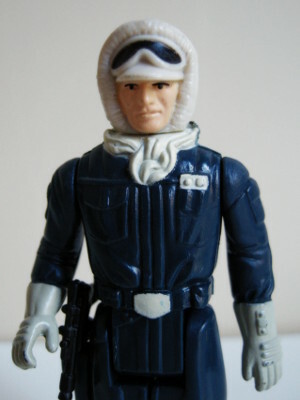 First issued in 1980 on 33-back The Empire Strikes Back packaging cards as Han Solo “Hoth Outfit”, the label was later changed to the slightly more macho “Hoth Battle Gear”. If you're one of those collectors who love to track down variants, the Hoth Han Solo should give you lots of fun. This is the dark tan version of his leggings, but there are various other shades, including rare, unpainted versions. There are also Han Solo figures with improbably pink faces and greater or lesser details on the body sculpt. My version has good, sharp detailing on his torso, holster, scarf and gloves – even the fur around his hood has a slightly stippled effect which is most impressive considering the tiny scale! His limbs are nice and tight and he has only the slightest amount of paint wear to his gloves – a common problem from pushing his (in this case repro) Rebel Blaster into his mittened hand. This particular figure shows the country of origin Hong Kong and the date indicated by “© 1980 L.F.L. ” running downwards on two lines on the back of the left thigh. You simply can't have too many Han Solo action figures in a Star Wars collection! *Thanks sis, for my fabulous Christmas pressie!